We began our Youth Education Program three years ago with our Aviation Scholarship. To date, we have selected five deserving local (Heber-Overgaard area) youth to attend EAA National’s Air Academy summer aviation camp. This week-long camp exposes the campers to all things aviation, including learning about airplane wing construction, ground school, flight instruction (helicopter and fixed wing) aeromodelling, aviation weather, aviation history, and flight. All of these activities use one or more disciplines within STEM (Science, Technology, Engineering or Math). In addition, the Advanced Camp is held during EAA’s AirVenture, the largest aviation convention in the world. Campers have the opportunity to talk to colleges, universities and federal agencies (NASA, Border Patrol, and many others) about careers in aviation. The Youth Build Project is the second phase of our Youth Education Program. This program is led by our Chapter Vice President, Curt Randoll. We are fortunate to have had a plane donated to the chapter. This plane, a KitFox, needs restoration before it can be flown again. Local youth will do the repairs under the mentorship of chapter members and some members of the community. Many of our members have careers in aviation, so participants may be mentored by air traffic controllers, airline and military pilots, mechanics, electrical engineers, FAA employees – the list goes on and on. 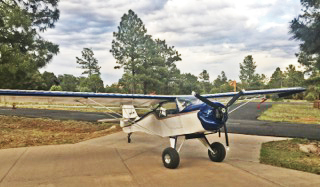 In addition, we have a total of twelve chapter members currently building or restoring planes of their own at Mogollon Airpark. Participants will sign in and track their hours in an FAA log book. These hours can be applied towards becoming an FAA licensed aircraft mechanic (A&P). Our goal is to expand our local youths’ career opportunities by exposing them to aircraft building, maintenance, and flying. This includes welding, drafting, engineering and so much more. These skills are applicable to many professions – they are not limited to a career in aviation. This project will also provide our participants with skills in team building, project management, public speaking, presentations, and leadership. As longer-term participants gain expertise they will begin to supervise newer participants – all under the mentorship of our aviation experts. Sponsors: Our sponsors include: EAA National, the Rural Innovation and Activation Network (RAIN), Sentry Fire and Welding, Aircraft Spruce, Stewart Systems and Leading Edge Air Foils. EAA National has donated a Lincoln welder to our Chapter. The Navapache Council of RAIN has awarded us a grant of $3,000 to help purchase materials and tools for the Youth Build Project. Our other sponsors have provided large discounts on our purchases. While the project has already started with a few participants, we are anticipating a kick off date in June. If you know of anyone interested in participating, please contact us.